CCA Kids Blog: New Surgery Care Package Sign Up Form! New link, new look for our surgery sign up. We are now using Google forms to capture your information for surgery care packages. 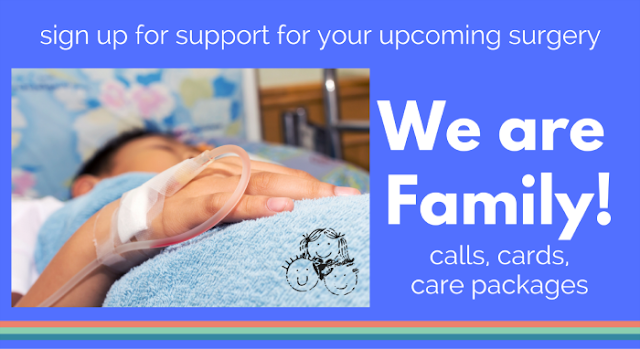 If you signed up, send us another request through this new link, and we will send your son, daughter, or loved one a care package when they have surgery. Thank you so much for bearing with us through this transition. In the care package, your loved one will receive for a "Get Well" card, a care package, or a call of support for you, your partner, or your child! We will work to match your needs with our resources, to help you get through the experience feeling loved and supported.